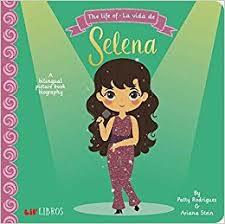 Our Cover to Cover Book of the Month for May is The Life of Selena by Patty Rodriguez & Ariana Stein. This adorable picture book biography pays tribute to an amazing star! Explore this books and learn more about Selena Quintanilla. Add something new and fun to your family biography and if you haven’t already, start a family rock band! Explain to your child that bands have names and invite your little musician to think of name for your group! Make homemade musical instruments. Boxes provide great sounds! Use the instruments to play along to your child’s favorite tunes, or create new music together! Send a picture of you and your child making music together. Be creative! We can’t wait to see what you loved about The Life of Selena!